Is your emerging company creating great, green jobs? 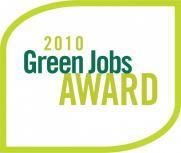 Do you know a company that is a leader in green job creation? Last night SJF Institute and the Council for Entrepreneurial Development teamed up to present the first of four CleanLinks Forums in 2011. Moderated by Rick Bain, Director of Business Development at Cree, Inc., the panelists included Michael Shore, Founder, President and CEO of FLS Energy; Wayne Flournoy, Founder and President of Entex Technologies; and Mark Munday, President & CEO of Elster Solutions North America. The panelists briefly described their own business models and then discussed key challenges facing cleantech entrepreneurs in the current economy. I recently attended a session on the Smart Grid at the Net Impact Sustainability Forum at UNC Kenan-Flagler. The forum consisted of representatives from multiple great companies, including Elster Solutions, O-Power, IBM and ENERNOC. A few salient points emerged from the session. Last night, in New York, SJF Institute and Green For All recognized the inaugural class of award winners of the Green Jobs Award.